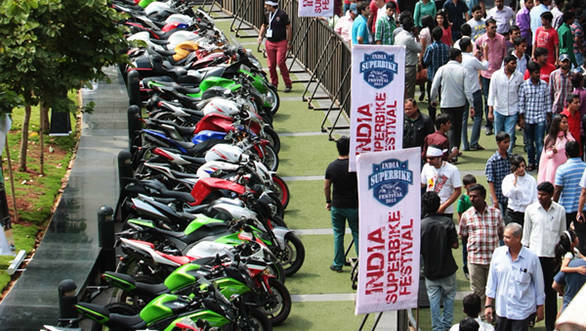 Last year saw the second edition of the India Superbike Festival (ISF) being held in Pune at the Amanora Town Center mall. The event saw enthusiastic participation from the biking community with more than 500 riders bringing their over 600cc rides. ISF this time will be held at Phoenix MarketCity in Bangalore on May 10-11, in what will be its third edition and if the past is any indication its best ever. The second edition saw participation from almost all types of two wheelers ranging from cruisers to sportsbikes and superbikes. There was also a section for vintage motorcycles which added a touch of charm amongst all the madness. Some bikes on display here were much older than any one present at the venue, but don't for a moment let the thought of them being slow come in your head. They were superbikes of their times and deserved every bit of envy and admiration they were getting. 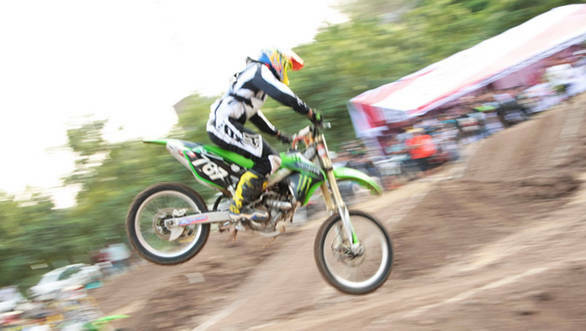 The festival also saw a motocross event which had MX bikes displaying aerial stunts and in the process, electrifying the audience. Last year saw bikes like Harley-Davidsons, Suzuki Intruders, Honda Goldwings, Kawasaki Ninja ZX-10Rs mingling with Ducatis, Aprilias, BMWs and every brand imaginable. The best was reserved for the last- we are referring to the ever popular burnouts. There's nothing like a burnout to get the crowd going all the way. Bikes screaming, tyres shredding and the smell of rubber is every biking enthusiast's heaven and last year many of them went there. This year will see all of this and the addition of an offroad track specifically for the visitors to have a go at. An expo for accessories, spares, safety gears and other motorcycle related equipments has also been organized to showcase the latest trends going on in the biking world. So, if you are a biking enthusiast and want to see some of the latest, oldest and best superbikes in India, you need to be in Bangalore on May 10. This year's event promises to be more exciting especially with the launch of several new bikes over the past year. Who knows? You might even get to see the complete lineup of cruisers from Indian Motorcycles. The India Superbike Festival (ISF) is back and it is set to be more awesome than ever. Set to ride into Bangalore on May 10, this two-day mega superbike event will be held at the Phoenix MarketCity. 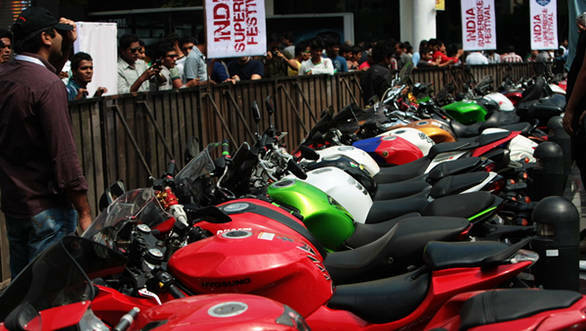 Last year, ISF Pune saw a record 500 bikers flaunting a wide array of superbikes in front of over two lakh visitors. With over a dozen new 600cc-plus motorcycles launched over the past few months, we are on course to set new benchmarks. The Harley Davidsons, Honda Goldwings and Valkyries, the Suzuki Intruders, the Kawasaki Ninja ZX-10Rs, the Ducatis, the BMWs and the Aprilias, you name them and they were there. From competitions to manufacturer displays to riding gear sales, last year's show was jam-packed with attractions. Apart from the above 600cc motorcycle category, one of the biggest attractions at the event was the vintage section where some of the bikes on display were almost a century old. The festival also featured a Supercross event with dirt track and MX bikes. This year's festival will also have leading bands from across the country playing on stage. Add to that a number of contests, burnouts as well as cool prizes and this year's event promises to be a lot of fun. Aside from events, global motorcycle manufacturers will be displaying their powerful and exotic superbikes at the venue. Last year, Suzuki, BMW Motorrad, KTM, Aprilia and many more had display spaces. Expect the list to get longer with a number of new players entering India. There will also be an offroad track that visitors can have a go at. The ISF has always emphasized on rider safety so expect products from global riding gears manufacturer on display. In fact, there will be an 'expo' showcasing accessories, spares and other motorcycle goodies. "The idea of the India Superbike Festival is to get bikers together to give them a platform to display what they own," says Amol Talpade, one of the organisers of the festival. And when you do that, you also meet like-minded individuals and share riding experiences.